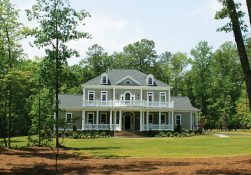 With over twenty-eight years of custom home building experience, Russ Hohmann has established his business by providing quality crafted custom homes. “Our personal pride is reflected in everything we do for our customers resulting in many referrals”. We pride ourselves in our craftsmanship and by using only the finest materials, as well as being available for our clients – even long after their homes are complete. We are here to assist our customers through the entire process of building their new house, from finding the right design, selecting exterior materials and colors to choosing the interior options that best suit their lifestyle and eventually taking possession of their custom home. Hohmann Builders have been a Featured Builders in the following East West Communities: Gatling Pointe, Founders Pointe, Graystone at Eagle Harbor, and The Riverfront at Harbour View.